Magnificent detached house of modern lines implanted in land with garden composed of fruit trees, centenarian oaks and benefitting from a great solar exposition. The construction is recent, using materials of good quality, highlighting the functionality and comfort, as well as a great luminosity inside. It has three bedrooms with private bathrooms and a common bathroom, large common room, furnished and with Led TV, kitchen equipped with all necessary utensils and appliances, laundry, barbecue and garage. It is situated in an extremely quiet and quiet place, served by access to the city and to motorway connections. It has a superb view of both the mountains and the sea, making it the ideal place for lovers of nature and tranquility. 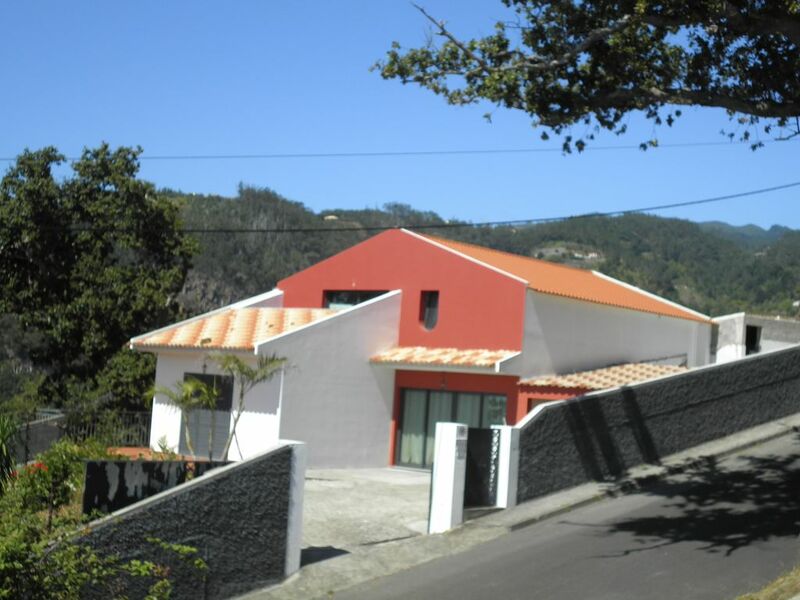 We also note that by car, we are only 10 minutes from the golf course in Santo António da Serra, Madeira Airport 10 minutes, 7 minutes from the motorway and 5 minutes from the center of Santa Cruz. At the request of the guest, the house has heating radiator, for an additional payment of 10.00 euros, per night and for each radiator used. At guest's request the house provides gas at 25.00 euros a bottle. This is a great house with fantastic views. Our hosts were friendly and welcoming and Martha speaks English very well. The house was very clean and the rooms are huge. Anybody staying in the winter or early spring should consider paying for heating, as it is not included. The house nestles into the hillside high in the hills above Santa Cruz which means there are wonderful views of the sea and terraced valley with its high waterfallls and wild flowers. The owners fruit farm is also visible. Here they grow many varieties of sub tropical fruits including anonas, lemon, lime, banana etc. The house is very comfortable and well equipped with a large covered parking area and large garden. The young couple that own the property were very friendly and helpful. They advised us on local markets, the best routes and all the other details that make a good stay into a superb stay. Thank you very much for your comment on our house. We are very happy that you enjoyed staying here. We really enjoyed meeting you and we hope you come back to Madeira in the near future. It will be a pleasure to have you stay again in our house. Heerlijk huis, zeer gastvrije eigenaren. Heerlijke week gehad in villa Luz. Ruim huis en alles aanwezig wat je nodig hebt. Groot terras, loopt van de voorkant naar de zijkant waardoor er altijd keus is voor zitten in de zon of in de schaduw. En het uitzicht....adembenemend ! Zee aan de ene kant, bergen aan de andere kant. Vanwege de ligging, in de bergen en niet in een plaatsje , is een auto noodzakelijk. Martha en José , bedankt voor het vele, heerlijke fruit en alle uitleg. Jullie zijn een geweldige gastvrouw en gastheer. Wij vonden het een plezier om jullie te lontmoeten. Wij komen graag een keer terug en maken dan graag gebruik van het aanbod om in jullie boomgaard te kijken. Thank you very much for your comment on our house. We are very happy that you enjoyed staying here. We really loved meeting you and we hope you come back to Madeira in the near future. It will be a pleasure to have you stay again in our house. Best wishes to both of you. We have just spent two weeks in Villa Luz and enjoyed every minut. The house is fairly new, very clean and with all you need to stay away from home. The view to the sea and the beautiful valley is breathtaking. You can walk along a levada just in front of the house up the valley to an interesting old Roman bridge. The owners Jose and Marta are extremely kind and helpful. Jose even took us to a big supermarket the first day, showed us Santa Cruz and the neighborhood and invited us to see his fields full of organic, tropical fruit. During our stay we did not buy any fruit - all was delivered by Jose and Marta which was very kind and appreciated. It certainly is a house and place we can recommend to everybody! Thank you very much for your wonderful comment on our house. We are very happy that you enjoyed staying here. You are a lovely couple and we really loved meeting you. We hope to see you both in the near future. It will be a pleasure to have you stay again in our house. Best wishes to you both. The property was perfect in every way - spacious and very well equipped to cater for all our needs. We had a fantastic golfing holiday which was made all the more special due to the kindness and warmth of Jose and Marta, the owners. The villa was so fantastic we only went out one night because everything we needed was at our temporary home and the views we too gorgeous to miss - the photos could never do them justice. The bed was great quality so we slept well and the kitchen and utility room had everything we needed for our stay. I'm very glad we hired a car as it would have been quite a climb up the hill on foot. The undercover parking ensured the car was in shade so cool when not in use. The villa was beautifully clean and tidy without being clinical - a perfect balance of homeliness without the feel of being in someone else's home. We can't wait to return next year and would not stay anywhere else now that we've experienced the best. Thank you very much Anne-Marie and Colin for your wonderful comment on our house. We are very happy that you enjoyed staying here. You are a lovely couple and we really loved meeting you. We hope to see you both next year. It will be a pleasure to have you stay again in our house. Best wishes to you all. Villa Luz hat uns sehr gut gefallen! Das Haus ist großzugig und hat alles, was man braucht und auf der Terasse kann man sowohl den Meeresblick als auch die Berge genießen. Marta und José sind sehr nette Vermieter. Alles war wirklich unkompliziert, wir haben uns rundum wohl gefühlt. Santa Cruz is a small city where the international airport of Madeira is located. It has an extensive pebble beach, as well as a beach complex, Praia das Palmeiras, which includes a public swimming pool for adults and another for children, as well as solariums, changing rooms and restaurant area. It also has an aquatic amusement park, the Aquapark. Santa Cruz has a beautiful promenade on the seafront where you can enjoy a beautiful walk or simply relax and enjoy the view while enjoying a meal or a simple coffee. There are many restaurants and cafes, as well as traditional shops, and to highlight, the Mother Church built by King D. Manuel I in 1533, in a Gothic-Manueline style, and is the second largest church in Madeira. 15 minutes away, in the parish of Santo António da Serra, we have the Santo da Serra Golf Club, which is considered one of the most spectacular golf courses in Europe, with incredible views of the mountains and sea. Built in 1937, Santo da Serra Golf was redesigned by Robert Trent Jones in 1991 and features 27 holes available for play, all characterized by generous fairways and greens and a choice of tees positions that favors all abilities . Every year the Madeira Islands Open takes place, integrated in the European Tour PG. There are a number of outdoor activities available in Santa Cruz and throughout Madeira, from golf courses, diving centers, para-comb, fishing, tours of the famous Levadas, museums, traditional street markets, public gardens, churches, protected reserves and much more to see and do.